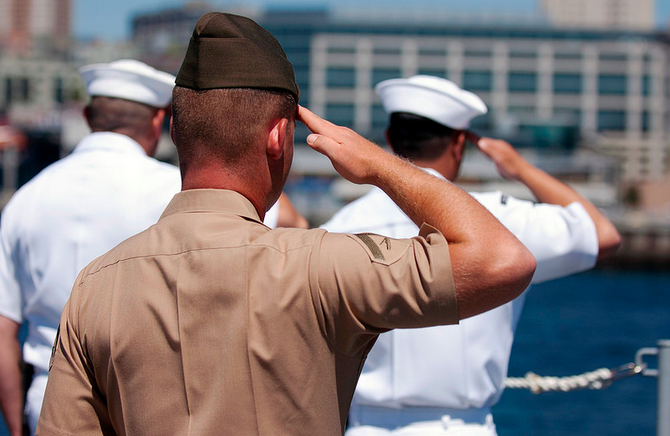 The Post 9/11 GI Bill aims to further the education of United States servicemembers and their immediate family members, but a new government report reveals that most of those funds are going to further increase the bottomline at for-profit colleges. Iowa senator Tom Harkin released a report [PDF] Wednesday that found for-profit colleges enrolled a record number of veterans and collected $1.7 billion in Post-9/11 GI Bill benefits during the 2012-13 school year – representing nearly a quarter of all GI benefits received during that timeframe. To illustrate just how much money the for-profit college industry receives from servicemembers and their families, one should consider that the entire GI Bill program cost four years ago was about $1.7 billion. The report highlights the top 10 recipients of GI Bill funds, and (no surprise here) eight of those schools are from the for-profit sector, including the soon-to-be dismantled Corinthian Colleges Inc.
All together those eight companies have received $2.9 billion in taxpayer dollars by enrolling veterans in their schools in the past five years, including $975 million during the 2012-13 school year. To make things even more infuriating, seven of those for-profit college companies are currently under state and/or federal investigation for bogus job-placement stats, grade manipulation, and misleading marketing practices. Of course it takes money to provide education for thousands of students, but in the case of many for-profit institutions few students actually receive a quality education, yet they pay nearly double what they would at a public university, according to the report. For-profit institutions boast some of the lowest graduation rates in higher education. Back in 2012 the Senate Committee on Health, Education, Labor, and Pensions (HELP), of which Harkin is chair, filed a report [PDF] that detailed just how troubling the dropout rates at for-profit schools were: 54% of students who began at for-profit institutions during the 2008-2009 school year withdrew by the summer of 2010. In fact, nine of the schools investigated in the 2012 study had withdrawal rates of at least 60%; the highest rate clocked in at 84%. And just how many of those companies also showed up in the top 10 recipients of GI Bill funds? Four. • Corinthian Colleges – operator of Everest University, WyoTech and Heald College – received $63 million during the 2012-13 school year. Yet, the company’s schools had a withdrawal rate of 66.5% during the 2008-2009 term. • Apollo Group – operator of the University of Phoenix, the College for Financial Planning and the Institute for Professional Development – received $271 million in GI funds during the last school year. During the 2008-2009 term the school recorded a withdrawal rate of 66.4%. • Career Education Corporation (CEC)- the operators of Sanford Brown and CTU – raked in $78 million last year, but in 2008-2008 the schools had a withdrawal rate of 61.7%. • Education Management Corporation (EDMC) – the operator of the Art Institute and Argosy – received $163 million in GI funds during the 2012-13 school year, but had a dropout rate of 63.7% during the 2008-2009 term. While Bridgepoint – the operator of Ashford University and owner of an 84% withdrawal rate – didn’t crack the top 10 in received GI funds for the most recent school year, it did make the top 10 when the entire length of the Post 9/11 GI Bill is considered. From 2009 to 2013, the company received $101 million in Post 9/11 GI Bill funds. One reason these schools continue to receive millions of dollars in GI Bill funds, while only partially educating veterans and their family members, is the lack of an over-arching rule to determine the quality of programs a school offers. Such a performance marker has been proposed twice in the form of the “gainful employment” rule. The initial rule was struck down by a court in 2011, but a second attempt was announced earlier this year. Among the new requirements set out in the proposed regulations, institutions would have to certify that all career-education programs meet applicable accreditation requirements, along with state and/or federal licensure standards. Programs would be deemed failing if loan payments of typical graduates exceed 30% of discretionary income or 12% of total annual income. Programs would be given a warning if a student’s loan payments amount to 20 to 30% of discretionary income, or 8 to 12% of total annual income. Discretionary income is defined as above 150% of the poverty line and applies to what can be put towards non-necessities. Although the rule is not finalized or in effect, the Harkin report puts the eight schools receiving the most GI funds to the test. And, once again, not surprisingly, the majority fail. When measured against the proposed gainful employment standards between 35% and 57% of the programs at Corinthian, EDMC, CEC and ITT Technical Institute would fail to demonstrate that they prepare students for employment in a recognized profession, according to the report. “Today’s report should be a wake-up call to the federal government. It’s a serious problem that Post-9/11 GI Bill dollars are often inflating these companies’ revenues instead of actually providing a meaningful education to the men and women who earned those benefits,” Connecticut senator Chris Murphy, a member of the HELP Committee, said in a news release. So, just how does a school with a dropout rate of more than 50% that is currently under federal and state investigation receive hundreds of millions of dollars in federal funds? Easy: There’s a so-called “loophole” in the 90/10 rule that regulates just how much federal funding for-profit schools can receive. See, the for-profit school industry is barred from receiving more than 90% of its revenue from the Department of Education federal student aid. The remaining 10% of revenue must come from other sources, such as private investors, wealthy corporations (like Goldman Sachs) and, apparently, the GI Bill. 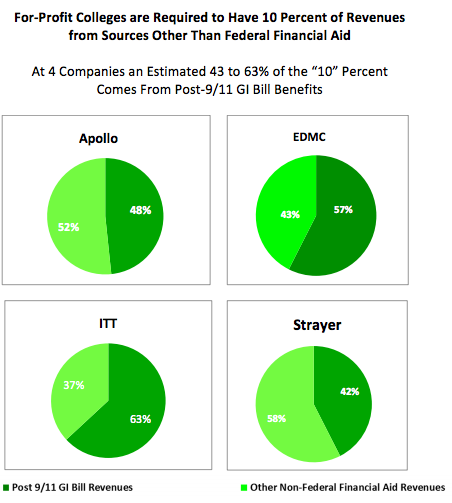 According to the report, at least four companies – Apollo, EDMC, ITT and Strayer – receive close to or more than half of their reported non-federal financial aid revenue from the Post 9/11 GI Bill benefit funds. While Harkin’s report is full of doom and gloom there may be one twinkle of hope when it comes to for-profit colleges: fewer consumers are enrolling than in previous years. However, that glimmer of hope is fleeting, considering record numbers of veterans continue to enroll at the schools. 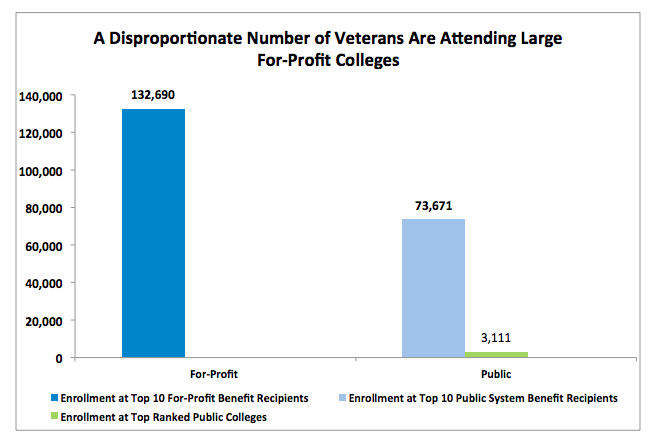 The report found that enrollment of veterans at for-profit schools increased from 23% in 2009 to 31% in 2012, despite the fact that overall enrollment at the institutions has fallen in recent years. In fact, fewer veterans are enrolling in traditional public universities; enrollment in that sector dropped from 62% in 2009 to 50% in 2013. That’s a shame, too, because attending a public university would save taxpayers millions of dollars each year. The average tuition at a public university is just $3,914 versus the $7,972 average tuition cost at for-profit schools. It’s unclear exactly why more veterans are choosing for-profit colleges over more economically-priced and recognized public schools, but there’s a pretty good chance it has something to do with for-profit’s purported convenience and aggressive recruiting methods. 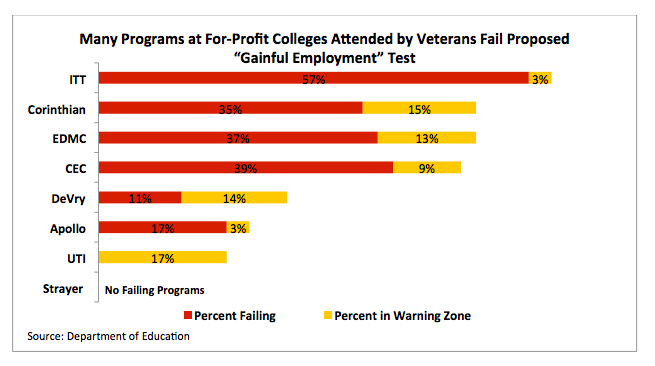 So, while the GI Bill was approved after D-Day as a way to educate the people who serve our country, the increased use of its benefits at for-profit colleges could be hurting veterans more than helping them. Harkin concludes that to better ensure the future education of veterans and their families, it is crucial that the federal government establish rules to track how veterans fare in the higher education system and that provisions be made to strengthen the 90/10 rule.